Lama Zopa Rinpoche relaxing immediately after receiving lungs from Khyongla Rato Rinpoche in New York, USA. Rinpoche will then teach on the Golden Light Sutra and give Most Secret Hayagriva initiation at Maitripa Institute, USA on November 2 – 4. Rinpoche then goes to teach at the Kopan November course towards the end of this year. 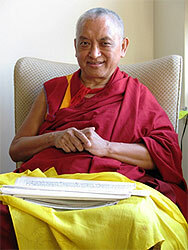 Rinpoche will teach at Root Institute, Bodhgaya, India from Dec 24 – 27 and give Great Chenrezig initiation on Dec 28- 29. 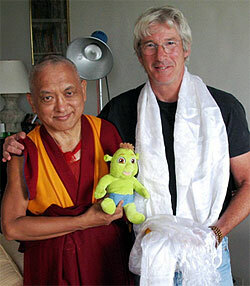 Lama Zopa Rinpoche has lunch and spends a relaxed afternoon with Richard Gere in NY. This new advice is a lovely explanation of the role and benefits of Dharma centers, and is an amazingly helpful and beautiful way for us all to rejoice at helping our local Dharma center. their lives to all happiness – not just that of this life, but that of future lives and the ultimate happiness of liberation from samsara and the peerless happiness of full enlightenment. How fortunate and happy I am! How fortunate and happy we are! Lama Zopa Rinpoche has requested that this very special advice be made available. This instruction was given to disciples by Achos Rinpoche, a great hidden yogi, and is followed by a short commentary from Lama Zopa Rinpoche. Please remember Rinpoche’s advice of one of the most effective things we can do to bring world peace – Rinpoche has also recently reminded us that this is the best practice we can do for the situation in Burma. Following Rinpoche’s request we have created a section on the FPMT website devoted to the Golden Light Sutra new website with key information about the exalted Golden Light Sutra. It includes the opportunity to download the sutra in several languages, report your recitations, and to share your experiences with the sutra. I am very happy to hear that center directors, members and students are doing well and working very hard to implement the Dharma and Lama Zopa Rinpoche’s advice. To have a harmonious and successful center, all the individual members need to develop kindness. Everybody can try to be friendly, whether you are going to work or to the center or when you are in your family. Then everything goes very smoothly and peacefully. Be patient and honest, always trying to benefit others and not to be upset or angry with others so easily. It is especially important to show respect and devotion to every teacher. Never criticize but always be positive to the Dharma teacher then naturally all Dharma brothers and sisters will develop respect for each other and give whatever help is needed to each other. In the center we all can help by treating everybody, new or old students respectfully and communicate with them from our heart. We need to think of everybody as human beings with one common goal of becoming Buddha. I request and pray for good communication every day with a smile. Congratulations to Lama Yeshe Ling Center, Canada. Bringing the total number of FPMT centers and study groups worldwide to 152! Rinpoche checks Jane Seidlitz’s progress in writing the Prajnaparamita sutra in gold for inclusion in the Maitreya Project. This volume will go in the heart of the statue. FPMT International Office would like to offer more support and recognize the work of all teachers helping sentient beings at FPMT centers and study groups. We’d love to hear any suggestions/ideas for how we could best do this. There are already some important guidelines for teachers which are kept in the FPMT Affiliates Area at Teachers. To this, with excellent input from some senior FPMT teachers we have recently added a guideline for those teaching in FPMT centers. Please have a look and send any feedback/suggested improvements to Claire. The second Work a Day for Rinpoche campaign was launched on Thursday September 27, 2007. This campaign is designed to support the vision that passed from Lama Thubten Yeshe to Lama Zopa Rinpoche and includes the activities of FPMT International Office as defined in the mission statement and the many charitable projects that have been presented by Lama Yeshe and Lama Zopa Rinpoche. Lama Zopa Rinpoche and FPMT International Office wish to thank everyone who participated in the first campaign for making it such a success and for their exceptional generosity and support. Partly because of requests for such a guideline, and partly because conducting a review is a great way to move forward for directors who have been offering service for 2 years or more, here is a draft Evaluation Guideline. Feedback and suggested improvements are requested by Claire! A review can serve as an opportunity for you and all working for the center to reflect on why you are offering service, and on how you can serve Lama Zopa Rinpoche in the best way. It is very important to make it clear and to remember that any review is being implemented with the intention of strengthening a harmonious working environment in which to fulfill Rinpoche’s wishes. We are currently working to develop a Death and Dying program for centers that is based on Lama Zopa Rinpoche’s teachings. It will include a new book titled Heart Advice for the Dying. Once completed, a homestudy version of the program will follow. Homestudy versions of Buddhism in a Nutshell and Buddhist Meditation 101 are also in the works. New – The Six Session Guru Yoga glossy booklet is now available from the Foundation Store. We also have the practice of Thousand-Arm Chenrezig available in PDF and hardcopy formats. Precious Mantra Caps are back, everyone! 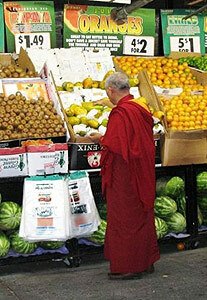 Rinpoche shopping in New York, USA. Dharma practice focuses on our minds. Even if we cannot transform all at once our negative states of mind into positive, the first step is to get to know what is really going on in there. The more aware we are of our reactions and attitudes, and all the little games we play with ourselves about what we want and don’t want, the better chance we have of gradually losing interest in the less appealing side of our nature and developing a happy and helpful disposition. to explore denial which by its very nature is the essence of something we are avoiding at a very deep level? Are we so attached to “having a happy mind” that we cling to our denial because we know intuitively that it helps us avoid looking at some “inconvenient truths” as Al Gore puts it, about the real effects of the way we live, on other sentient beings. What we have to ask ourselves is, can we maintain a genuine, deep-rooted happiness based on denial? Would we actually feel happier if we took a real look at what we are doing instead of hiding away from it? Can we really engage in genuine meditations on compassion if we don’t engage in everyday actions which are congruent with our focus in meditation? Maybe we would find that changing the way we live would not be such a hardship after all, and that there would be incredible joy in starting to engage in a non-harming lifestyle. Every day we could rejoice at the huge numbers of sentient beings which we have saved from harm just by simple everyday actions such as switching off lights, turning down the heating, traveling less, and so on. 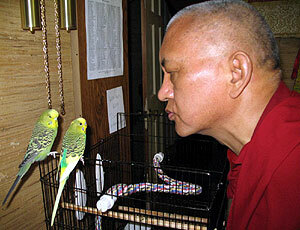 Rinpoche benefiting sentient beings in New York, USA. Look for the full story in Maureen’s obituary coming in Mandala magazine.